Emerald Cove Sushi Nori makes tasty "Temaki" sushi cones. Rinse and drain rice in fresh water three times or until rinse water is clear. Allow the rice to rest for about 30 minutes. Add 2 ¼ cups water and a pinch of sea salt, then bring to a boil. Cover, lower heat, and simmer rice for about 10 minutes, or until rice has absorbed almost all the water. Turn off heat and let sit for 10 minutes before removing cover. Mix sugar, salt, and vinegar, and pour over rice. Stir rice thoroughly but gently with wooden fork or bamboo rice paddle. Rice is ready to use when it has cooled to room temperature (use immediately). Any combination of long, thin slices of avocado, cucumber, carrot, tofu, raw sashimi-style fish, cooked shrimp, egg, chicken...whatever you wish. 1. 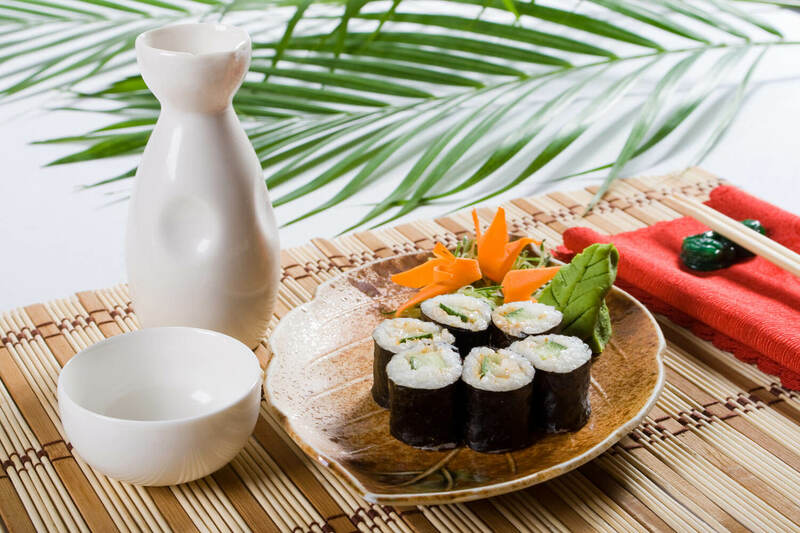 Place nori sheet on bamboo mat or napkin. Wet hands in cold, salted water to prevent rice from sticking to them. Spread rice evenly over the nori about 3/8 inch thick, covering all but a 2 inch strip along the edge farthest from you. Lay first choice of fillings in a row at the near edge and add garnish. 2. 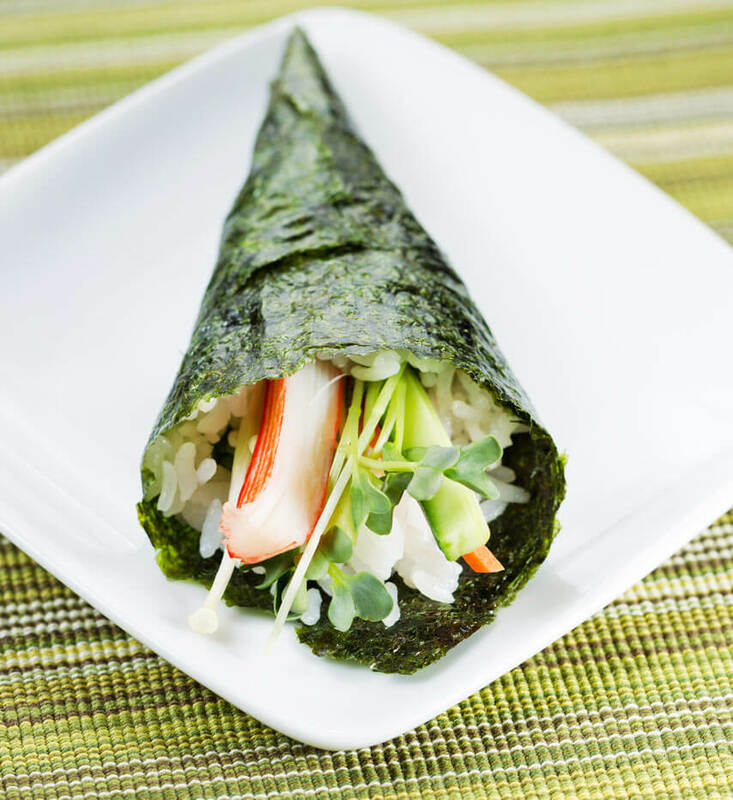 Moisten the far edge of the nori with fingers dipped in water, and roll the mat firmly. Remove the mat as you go, and press the moistened end edge against the roll to seal. 3. Place the roll seam side down, moisten knife to prevent sticking, and carefully slice roll into 6 to 8 pieces. To serve, pour shoyu or tamari in a shallow bowl to dip sushi slices in. Garnish with umeboshi paste, Sushi Sonic® Pickled Ginger, Sushi Sonic® Real Wasabi, toasted sesame seeds, or your own favorite. Great Eastern Sun has joined forces with a new Japanese-Chinese company cultivating Certified Organic Nori (Porphyra yezoensis) in the coastal waters off China to bring you better taste and higher quality at a lower cost with the guarantee of purity that only Organic Certification can bring. The Japanese partner is a long-established nori producer with more than 100 years experience growing and processing nori. 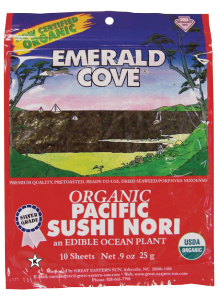 Emerald Cove® Organic Toasted Sushi Nori is cultivated from certified organic nori spores gathered from the previous year's crop. The young plants are nurtured in protected aquatic beds free from pollutants until they are strong enough to be transferred to nets in shallow ocean waters. We never treat these nets with herbicides, pesticides, or fungicides, but instead remove invading pests by hand.